The latest development was the resignation of team captain, Zurab Azmaiparashvili, who, in a strange twist of fate, called for Gashimov’s reinstatement and talked of how his association with Kasparov hindered his chances of remaining a FIDE Vice President. Before getting to that, however, it’s worth recounting the whole course of events since the story was last reported here. But, taking into account the situation, when such a player as Gashimov doesn’t play in the Azerbaijan team but plays in Spain’s internal championship for the Kasparov team, then here, of course, there’s a political subtext, and it was necessary to think it over a hundred times before taking such a decision. 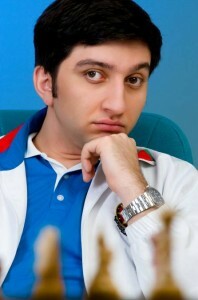 We didn’t expell Gashimov from the team – he decided not to play himself. Our doors were open to him, but he had to come and make peace with all the members of the team and admit his mistake. In my opinion in the current situation we can talk about a “star illness”. After the European Championship Vugar Gashimov fell ill with exactly this “star illness”. The strange thing about this “star illness” (getting “too big for his boots”), is that no-one outside of the upper echelons of the ACF seems to have noticed it. The German grandmaster Jan Gustafsson, for instance, writes in his blog that Gashimov would always invite his Kasparov-Marcote teammates for tea and help out with preparation. Similarly, the repeated idea that Gashimov needed to apologise to his Azerbaijan teammates is certainly not true for two of them. Rauf Mamedov posted at Facebook: “Azerbaijan team without Gashimov, Azerbaijan team without heart!” While Gadir Guseinov gave an interview published the day after the press conference: “It’s a great loss for the team as he’s a wonderful chess player”. There was no reprieve and the Azerbaijan team left for Khanty Mansiysk without Gashimov. 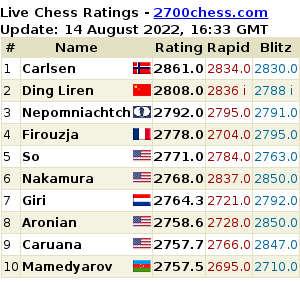 Their performance there was reasonable, with all the players performing at around their rating, except for Gashimov’s replacement, Eltaj Safarli (rating 2607, rating performance 2498). If Rauf Mamedov had converted a winning position in the last round they could have finished 5th, but in any case, as expected, without Gashimov they failed to challenge for a medal. What’s behind the conflict between Vugar Gashimov and Zurab Azmaiparashvili, which the press is gossiping about so much? At the Team World Championship this year in Bursa, after a series of unsuccessful games, I asked for a day’s rest when we were playing a weak team (Egypt), so that I could recover and then re-enter the fight. That was the first time I’d asked Azmaiparashvili for a rest. I’d played 13 games without a rest and in the whole of 2009 I’d only lost once, while here I had a bad series of results and had lost two games. I was, to use boxing terminology, knocked down and, knowing that we were playing the weak Egypt, I mentioned my condition in the team meeting. The guys supported me, agreeing I needed a rest, but the next day I discovered that I was still playing – the captain had ignored my request. I was shocked! I also lost to Egypt, and was completely knocked out, after which, to my great regret, I wasn’t in any condition to continue at the tournament, however much I wanted to. After 7 matches in a row and meant to play white I asked for a rest and said something like: I’m as tired as a dog, I’ve got no energy left. And I asked 10 times. I was totally ignored: hence my result in the game with Hungary, so there you have the role of the captain!? After his loss against Hungary Guseinov only played, and lost, one more game, which contributed to the team’s weak performance in the final straight. Azmaiparashvili later admitted to his mistake (in the interview discussed at the end of this report), but added the twist, “At first I agreed, but then, having listened to the guys, I changed my decision.” Which again has echoes of Bursa (where a reason given for Gashimov not being allowed to rest was that Radjabov would have to play black twice in a row). When in Serbia I lost a won position in the match against Armenia they would often remind me about it. In general the press wrote about it 10 times more than they now write about my revenge. Then they wrote that we’d lost because of me. While now they write that someone had fixed a victory over the Armenians. That’s all off-topic, but there’s simply no objectivity and most likely never will be any. I would unequivocally say no i.e. the fact that Gashimov didn’t travel in no way affected the result, because the internal relationships in the team and its cohesion abroad are a whole lot more important. Beating Kasparov at 15 years old instead of playing in his club. Do you see the difference? Although the whole situation within Azerbaijan chess is hard to comprehend for an outsider it’s perhaps worth mentioning that the general opinion on forums seems to be that favouritism for Radjabov, in particular, is the main explanation for the recent treatment of Gashimov, and that Mair Mamedov is the driving force behind it. I think you can assess it as normal. At 4 out of 5. I realise that back home they expected a lot from us but the reality was that this was the maximum we could count on. Because Vugar Gashimov wasn’t in our team. That’s the main reason we finished outside the top-10? Well, that and the team captain Zurab Azmaiparashvili not being able to be with us for the whole tournament. He was putting himself forward for the post of FIDE Vice President and had things to do. Let’s start with the Olympiad. You agree that you didn’t give the team enough attention? I knew that I’d be short on time, as the FIDE Congress was taking place here. Therefore I tried to delicately decline the captaincy. Many thought that it was because I’d fallen out with someone on the team, but that wasn’t it. I felt that I couldn’t put my whole heart into the guys at the tournament. I gathered the team together in the evening, then in the morning gave them instructions. But it’s clear that because of the elections I had lots of other meetings. Our team showed its character at the Olympiad. Did the absence of Vugar Gashimov have a serious effect on the result? It wasn’t only Vugar Gashimov who wasn’t in the team. 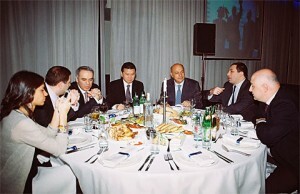 Zurab Azmaiparashvili wasn’t there either. Taking that all into account the result can be considered normal. The team was also unlucky, we didn’t take our chances in the match against Italy. In the last round Rauf Mamedov should have won. In that case we’d have been in the top 5. When did you decide that it was time to go? Even before the last round at a team meeting I told the guys that I was seeing them as a captain for the last time. I maintained friendly relations with everyone, but I’m going. In addition I told them I’d do everything I could so that in the next major tournament Vugar Gashimov would play with them. Your resignation is connected to the result? Who do you see as your replacement? You can always find a captain. There are a lot of good captains in the world, but players are few, so Azerbaijan can’t afford to lose one of them. From now on you won’t be FIDE Vice President? Why? I knew that I was going to be in a vote for that position, but I didn’t feel any support from Ilyumzhinov’s team. I don’t know what the reason was. Most likely it was connected to the name of Garry Kasparov. Everyone in FIDE knows perfectly well about my relations with Garry. No doubt the fact that he supported Karpov played a role. The other thing was that in the ECU elections I was a supporter of Silvio Danailov, while FIDE was supporting Ali Nihat Yazici. Before the elections you said that some countries were supporting you. They simply worked against me. I don’t think that it was an order from Ilyumzhinov. But I do know that some people who’d promised me their vote were “worked upon” by others. Did you talk about it with the FIDE President? I told him I won’t agree to any propositions and I’m not planning on taking up any positions. Ilyumzhinov named five FIDE Vice Presidents, although the rules only allow him to name two. As a delegate of Georgia, I’ll do everything I can to put right that breaking of the rules. So I’ll sue them and demand justice. I can even tell you that in the near future Kutin, Gelfer and Yazici will lose their FIDE posts. Perhaps Zurab Ashmaiparashvili’s departure (though his resignation is yet to be accepted) will free the way for Gashimov to return to the Azerbaijan team? Though, as the above should have made abundantly clear, the problems in Azerbaijan chess go a lot deeper than a dispute between a chess player and his captain. Thanks! At least the Azeris seem to know what (all) went wrong, while the Russians are still a bit puzzled. BTW, the SOCA Azerbaijan team at the forthcoming European Club Cup will have guest stars Shirov, Grischuk, Vachier-Lagrave and Kasimdzhanov, and the team captain will be Vladimir Tukmakov (captain of the winning Ukrainian team at the Olympiad). But this summary is missing the key point: the Kasparov-Marcote team has nothing to do with Kasparov. It’s the team of an important chess school located in a small village in the northwest of Spain (Mondariz), which was named after him as a tribute. I’m pretty sure Kasparov almost forgot he was there a couple of times, and of course he doesn’t finance or direct the team. wotan, you’re right, of course. The criticism about the “Kasparov” school is totally absurd. Plus Gashimov played for the same team the year before (with no scandal), Radjabov has played on the same team as an Armenian player and of course there’s the (ex-) team captain’s actual links to Kasparov. This article has many interesting news, and confirms that mishanp’s blog has reached the “indispensable” level among chess news sites. 1: It seems to me that the decision to leave out Gashimov was taken by the President of the Azerbaijan Chess Federation Rustamov, who received orders by the Minister of Sport Ragimov. This means Gashimov’s exclusion has political bases, and that Zurab Azmai was only an executor in this saga. 2: It’s interesting to note that only “second tier” players Guseinov and Rauf Mamedov protest and defend Gashimov, while top players Radjabov and Mamedyarov remain silent. IMHO, this implies that they do have a special status, they are aware of that and think there is nothing wrong with it. 3: Azmai’s fall (if this is really his fall) is rather pathetic, like every fall of a tyrant’s minion. He whines about how Kirsan broke rules to fire him and demands justice, but when he was in power he was a mayor executor and beneficiary of this corrupt system. Radjabov’s dad. The money of Radjabov’s dad. Nothing should be allowed to eclipse Radjabov. Therefore, no Gashimov. You almost got to the crack of the matter! Yes Teimur Radjabov’s family is a very powerful Jewish family that sponsors/controls chess in Azerbaijan. As usual it is not enough to be reach, but they also want to be famous. Little Teimur was “destined” to bring them fame, but unfortunately for poor Gasmihov he is now seen as interfering with these grand plans. See the following article . . .
Every time he goes to the French Riviera he desperately tries to get photos for his marketting campaign . . . he just wants to be a Hollywood star and doesn’t give a fig about Azerbaijan. @chessobserver: I don’t know what your two links add to the story, and it’s at least odd to state in this context that Radjabov’s family is Jewish. If they were Muslims it would also be awkward to mention it, though less “newsworthy” as most Azeris are. If they were Christians or atheists, you probably wouldn’t have mentioned it …. .
And if the Radjabov family sponsors chess in Azerbaijan in general (rather than just Radjabov’s own career), they seem to care about others – at least to some extent. I, who had the privilege of playing in the same team as Gashimov, have to say that he is a modest and likeable person… Such incidents are not a matter of reasoning or judgement, of course. Some authorities are inclined to show players who the boss is. “This is their existentialism”, one may say, but what is the “business” part, actually ?